Well one of the greatest thing about making ice cream is your imagination. This one just hit me one day when I had so much leftover candy. 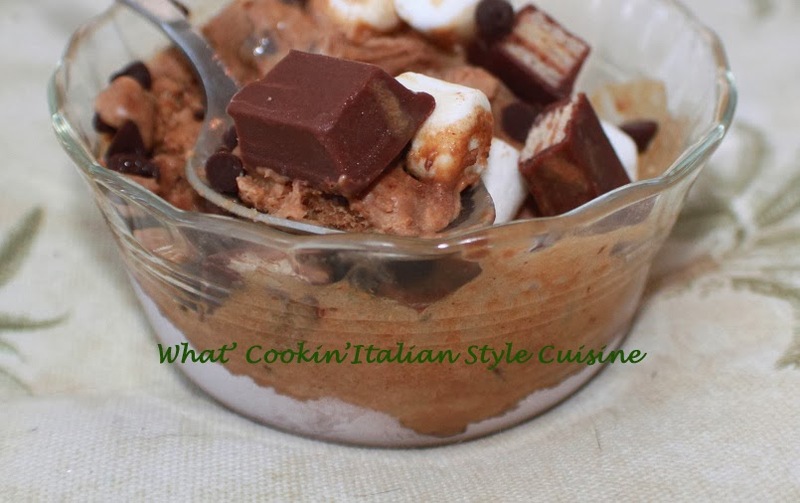 I looked at those kit kats and thought, cookies, chocolate, marshmallows and this ice cream was created! A keeper for us and hope you love it too! Heat the milk until the edges start to bubble. In the meantime put the broken up chocolate in a food processor until almost powdered fine. Add the hot milk to the food processor and pulse till smooth. Cool completely and refrigerate for 2 hours. Add the heavy cream and vanilla until all blended together. Place into your ice cream maker and churn for 20 minutes to the manufacturer suggestions. Add the mini marshmallows, kit kat bars that have been broken up in bits and mini chips. Place in a freezer container. Freeze for 2 hours before serving.